When the snow came, it made up for lost time. 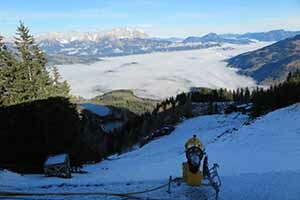 The warmest early winter in the memory of Europe’s ski resorts came to an abrupt end just before new year. When I visited the sheep were still in the valley. Like sheep fleece or layers of cotton wool the fog, too, sat in the valley in the morning, luxuriant deep-carpetted mountain beauty that was as surprising as the under-performance of the snow conditions. Two worlds, one below and one above. Austria’s advantage is that skiers stay in real villages before they take to the mountain, not 1960s concrete tourism consturctions. 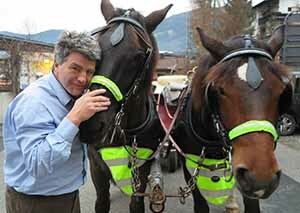 It explains why Austrians still win two out of every three world cup races. Grow up in one of these villages and the snow becomees your schoolmate. Gastein has 11,000 full time residents and 30,000 beds for those who come to play. Then the sun erupted, glorious and bright. The jetstream of an aircraft has put a spray foam on the sky, like the pilot was attempting to spell out the name of someone they loved high over the ski lift. Snow conditions turned bright again, and then, as we skied downhill we ceonuntered a line across the piste like a micro-climate, than back into ice again, with the grating grizzling sound that conjured up out nothing so much as a broken leg. Sometimes a new lift can change the entire rhythm of a ski resort. Last year the Télécabine de Tovière opened in Espace Kill, replacing a slower lift which allowed six persons to stand. Now the Telecabin can accommodate 10 people seated. It is a small change but has changed the dynamic of that section of the terrain. A new lift is a multi faceted thing. People plan their day differently. That means a lot in Espace Killy, where 80 lifts bring 100,000 skiers on to the mountain each day, (it should be Kelly, the terrain was named for the ski champion descendant of a Tipperary-born Napoleonic soldier). My plan, as always is to travel far from the accommodation on the first lift, as far as I can. It takes just seven minutes main lift link to Val d’Isere, then onwards to the top left hand corner of the piste map was my target in Espace Killy. Alex Stojanovski, who had skied in the Olympics for Macedonia took me out to show me the slopes and planned a series of journeys for me. I would make my way back slowly. By the end of the week my route had become a routine: Tufs, Edelweiss or Creux/Mont Blanc, Marmottes, Fountaine Froide, Santons, Solarise Express, Loulette, Glacier, Leissieres, Col De L’isrran, Pyramides down to Le Former, a short bus journey and the Olympique home. The conversations, after the breathless skies, were short as a lift run and in a shared language of snow lovers. Skiers of all levels quickly find their favourite staging pistes, lamp pistes, piste boxes and falling pistes. 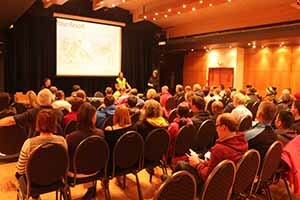 The much-skied Prarirond has become known as paranoid to the large Anglophone audience who come every year. Two slopes have the distinction that people get tattoos with their names: Combe and Anemone (accessed by Palfour lift). The routine brought me into Val d’Isere every day, trying to avoid a tumble on the scarey black that everyone who visits the iconic resort spends at least part of the day watching. If you are going to fall, fall down in public. Val d’Isere has an air of history and stability about it, important for those who value such things when the French Alps were invaded by custom-built 1960s steel and concrete resorts. Ski resorts should all be about the terrain. They should be about the snow and the slopes and the view from the mountain. There are also lots of young families, childcare costs eu40 in the morning, eu40 afternoon, or Eu10 an hour and Eu15 in the evening. The key selling point of Sierra Nevada, the southernmost ski area in Europe by a very long way, is the sun. You cannot miss this bright shining fact, even after it has set. The brochures, websites and posters have told you about it long before you reach the mountain and repeat it at every turn, the morning sun throwing dramatic shafts of light and shapes onto the snowscape. The Sierra’s gentle slopes and wide runs make it good for beginners and intermediate skiers, not to mention noisy snowboarders in those irritating clown hats. 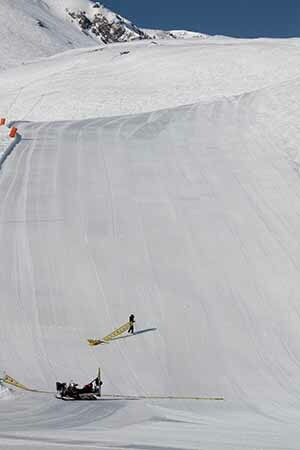 When they are all open, the total length of the 39 ski runs stretches to 61km. The longest run is the 3.5km Rio. The resort is controlled by Cetursa, a public-private partnership. 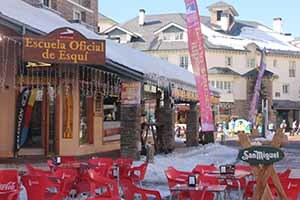 They run the public transport in the resort through its layer cake of Sol y Nieve, from to the high spot of Pradollano as much as the ski lifts. Recent investment includes a new chairlift with increased capacity and what they claim is the largest snow making system in Europe which guarantees the resort will be open, careful that no American style chemicals are added. It is a big operation. Many of the slopes are south facing. It means sometimes that the wind stops by instead of the sun. 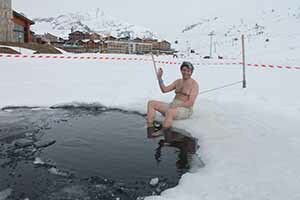 Because of the altitude, most skiing is above 2,600m, the season is long, running from the start of December to the May bank holiday weekend, turning the resort into an each afternoon beauty contest of bikinis and T-shirts. 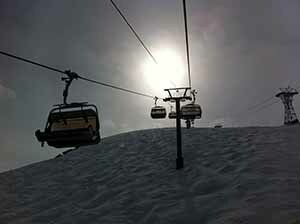 The lifts run long hours too, from 9am until a staggered closing between 4.45pm and 5.30pm. By the time you finish your ski run, the sun itself has called upon all its forces to remind you. 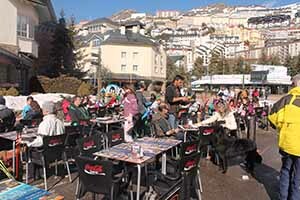 It is baking hot and crowds of people are soaking up the rays in the strip of bars at the bottom of the pistes. These bars, Cuna, Tia Maria and Parallel look and feel the same. Unlike the more intimate smaller ones they don’t serve tapas with the drinks, but they serve a different purpose. Their terraces face the afternoon sun and straight towards the mountains, away from the resort. On Saturdays you can relax in a deck chair for a few hours in the afternoon, then head back up for more skiing. 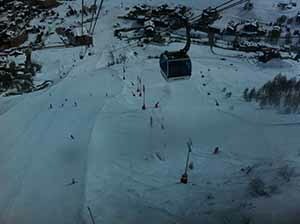 From 7pm to 9pm at weekends the gondola reopens and the long, sweeping El Rio piste is floodlit for night skiing. This is a big deal, because Sierra Nevada is well set up for a short ski break. It is 32km from Granada, and two hours from Malaga and the playground of many Irish owned holiday homes. It is a longer flight time but a short stay in the sunshine and the free tapas in many of the bars makes you wonder why more Irish do not come. The clever thing is to hire a car and drive. By public transport there are three buses a day to Granada and one to Malaga, Granada is a 45 minute journey and costs €9 return. If the snow doesn’t fall, and even if it does, Granada is only half an hour away. In winter, there are few lovelier sights than the Alhambra’s delicate red brown walls, a striking ancient foreground against a towering backdrop of hard white. It is at night that you realise that you are in southern Spain and why the Nevada is somewhere special. Now the bars turn into centres for the performance arts, real tourism attractions, instead of the Apres Ski that we are used to. Young people take out the guitars and start the flamenco session. There isn’t room to swing a mouse, never mind a cat, but improvised dances are taking place along the narrow bar aisle. All along the bar the trappings of Andalusian culture, hung hams, difference grape-based drinks and fire waters that would knock the ice off an avalanche. It is splendid, and it is inexpensively splendid. Sometimes when we ski we end up in a barn with overpriced drink, piped music and rude service. On the Sierra Nevada you find the polar mountainous, snow-covered avalanchous opposite of those things. 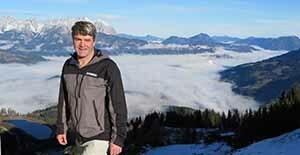 Eoghan Corry travelled to Austria courtesy of Topflight, who offer charter flights to Salzburg. See +3531 2401784 www.topflight.ie or your local travel agent. 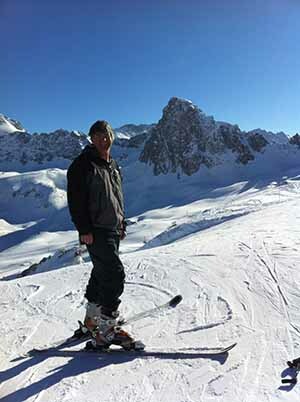 Eoghan Corry travelled to Tignes courtesy of Crystal Ski, who offer charter flights to Chambery. See +3531 4331010 www.crystalski.ie or your local travel agent. Eoghan Corry travelled to Sierra Nevada courtesy of the pnaish Tourist board. Aer LINgus fly to Malaga year round. Swee aerlingus.com for the best prices.